In the past nautical flags were used by sailors to communicate between land and sea. However, in the age of modern communication technology, nautical flags are more used as decorative items during special occasions and ceremonies.Tuff Flags has various models of nautical flags like yacht flags or international signal flags among others. 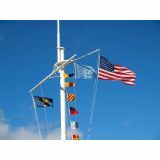 100% made in USA nautical flags can be used to add a speck of color and identity to your yacht, grab easy attention in the waters, celebrate your Yacht club or use as warning signal.Shop from our complete line of Nautical Flags right away and avail the best prices, quick shipping and much more! Considering flags are our business, we at Tuff Flags even stock a complete line of nautical flags including International Code of Signals flags at unbeatable prices. Offered in various sizes and prices rates, these flags can even be used to bring in a nautical theme into your home décor. We have a range of products including pennants, officer’s flags, signal flags, boat flags and a lot more. 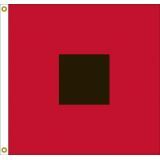 Made of heavy duty fabrics, these nautical flags will come to your aid when emergency strikes in deep sea. Browse our collection of Nautical Flags and pick up a model that you needs or if you are not sure how to go about it, call us at our toll free number (888) 287-3524 or email us at customercare@tuffflags.com for further assistance.